Do you ever feel like you are being held back from reaching your potential–and that life is always getting in the way? But then you realize the problem is really inside YOU? It’s so hard to acknowledge that sometimes. Eric and I recently attended the Best Year Ever Live conference, which was such a GREAT experience. Michael Hyatt guided us through writing out our dreams in 10 different life domains. 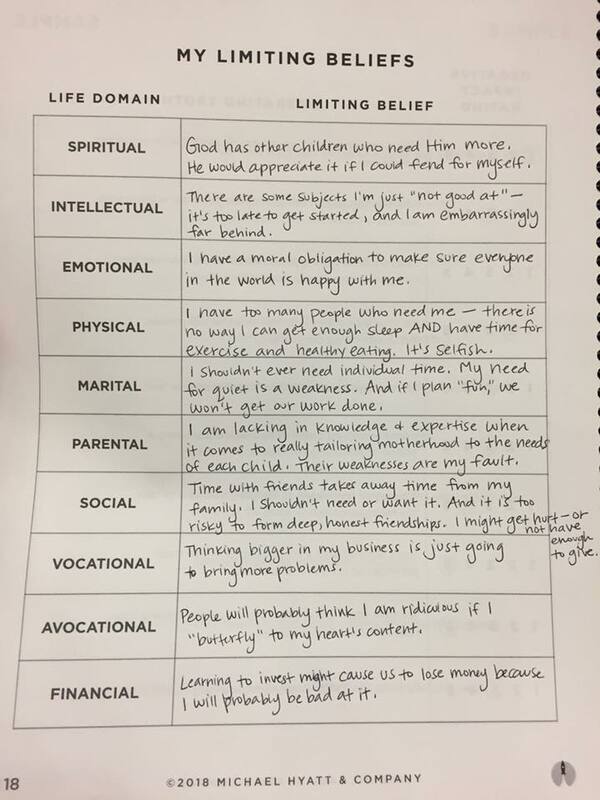 Then we identified the “limiting beliefs” holding us back. Wow. It was a huge wake-up call that helped me to see that I was subconsciously setting myself up for disappointment time and time again. It is incredibly hard for me to post things like this, but I’m pretty sure I’m not alone. Working through this exercise has had a truly positive impact on me, and I hope it can help you, too! 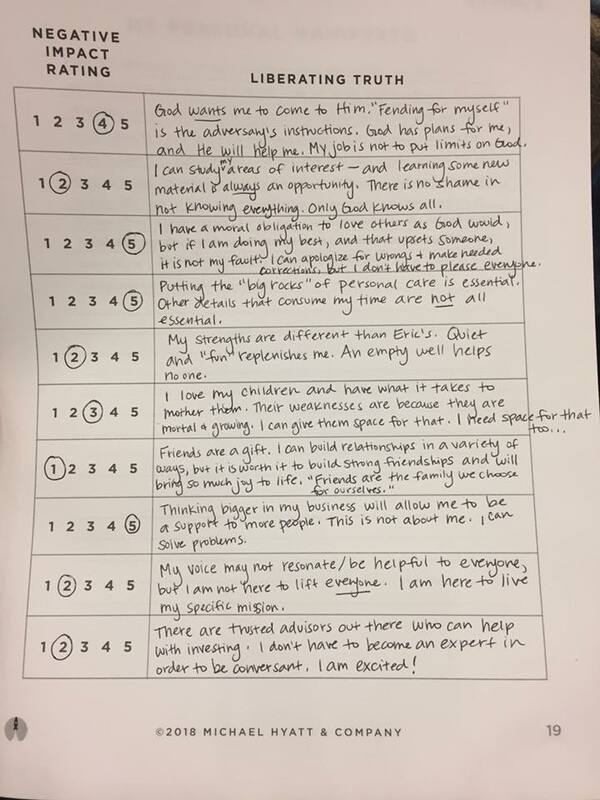 Here are photos of the actual worksheets, but in case they are hard to read, they are also typed out below. Feel a consistent, lifting spirit each day. Hear Him. Unwavering faith, knowing I can ask for help whenever I need it. Consistently challenge my brain – new concepts, ideas, quotes, skills, abilities. Feel “alive” through books, conferences, classes, and online learning. Record what I learn. Dramatically reduce anxiety and fear. Be confident in who I am and what I am choosing to do with my life. Do not let “people pleasing” or unnecessary guilt prevent me from thriving. Get more solid sleep at night so I can invest energy hiking, skating, or doing other exercise I love during the day. Always have plenty of green vegetables on hand. Find that balance between being engaged in one another’s goals and projects and giving each other space to think and focus on individual needs. Create time for more fun. Be more deliberate each month/week about the kinds of activities and the amount of support I give to each child. Don’t parent “4 kids” – be a deliberate mother to Alia, Grace, Ethan, and Spencer. Plan date nights and family activities with friends we can trust who lift us and can speak candidly about navigating life well. Inspire and support one another. Really come alive this year. A beautiful foundation is in place, and it is time to think bigger, but shift into stronger leadership (instead of trying to do too much myself). “Butterfly” at Power of Moms. Limiting Belief: God has other children who need Him more. He would appreciate it if I could fend for myself. Liberating Truth: God wants me to come to Him. “Fending for myself” is the adversary’s instructions. God has plans for me, and He will help me. My job is not to put limits on God. Limiting Belief: There are some subjects I’m just “not good at” — it’s too late to get started, and I am embarrassingly far behind. Liberating Truth: I can study my areas of interest — and learning some new material is always an opportunity. There is no shame in not knowing everything. Only God knows all. Limiting Belief: I have a moral obligation to make sure everyone in the world is happy with me. Liberating Truth: I have a moral obligation to love others as God would, but if I am doing my best, and that upsets someone, it is not my fault. I can apologize for wrongs and make needed corrections, but I don’t have to please everyone. Limiting Belief: I have too many people who need me — there is no way I can get enough sleep AND have time for exercise and healthy eating. It’s selfish. Liberating Truth: Putting the “big rocks” of personal care is essential. Other details that consume my time are not all essential. Limiting Belief: I shouldn’t ever need individual time. My need for quiet is a weakness. And if I plan “fun,” we won’t get our work done. Liberating Truth: My strengths are different than Eric’s. Quiet and “fun” replenishes me. An empty well helps no one. Limiting Belief: I am lacking in knowledge and expertise when it comes to really tailoring motherhood to the needs of each child. Their weaknesses are my fault. Limiting Belief: Time with friends takes away time from my family. I shouldn’t need or want it. And it is too risky to form deep, honest friendships. I might get hurt — or not have enough to give. Limiting Belief: Thinking bigger in my business is just going to bring more problems. Liberating Truth: Thinking bigger in my business will allow me to be a support to more people. This is not about me. I can solve problems. Limiting Belief: People will probably think I am ridiculous if I “butterfly” to my heart’s content. Liberating Truth: My voice may not resonate/be helpful to everyone, but I am not here to lift everyone. I am here to live my specific mission. Limiting Belief: Learning to invest might cause us to lose money because I will probably be bad at it. Liberating Truth: There are trusted advisors out there who can help with investing. I don’t have to become an expert in order to be conversant. I am excited! Seeing on paper the thoughts that were holding me back was incredibly eye-opening. It gave me some concrete ideas for mindset shifts I need to work on this year, and I hope that as you start walking through what you really want for your year, this exercise can give you a boost. If you DO decide to give it a try, please report back in the comments section! We’d love to hear from you. We’re excited to be able to serve you at LearnDoBecome this year! 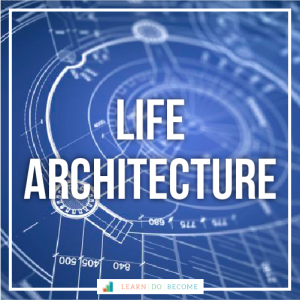 If you haven’t yet heard our exciting announcement, we’ve opened our 2018 Life Architecture Beta Group through January 31st to anyone who REALLY wanted to be a part of it but didn’t get a chance to join Michael Hyatt’s Best Year Ever program (for which Life Architecture was a special bonus). Click the link above or the “Life Architecture” image to learn more! Thank you for your honesty and Candor. Yes, it’s difficult to share our most personal private thoughts but it is so helpful and liberating to all those around you. Thank you for your bravery and support. Very wise and informative! Thanks for sharing. Just seeing your comments on each item opens my mind to truths & untruths that I believe. The truths are great, but the untruths need to be evaluated to find what is best for me. The thought of putting my fears and feelings on paper is something I don’t have the courage to do yet. But I’m glad you did. This exercise was a huge eye-opener for me. I am amazed at how often I tell myself my limiting beliefs. After going through this process about 3 weeks ago, I felt so empowered by the liberating truths I had written, but I find that even after such a short time I’m hearing those limiting beliefs trickling back into my life and into my head, even though I’ve made some really good progress on a habit I wanted to put into place…I can only see what I’m lacking. Some of my bigger goals seems so unattainable with everything going on and with that voice in my head telling me I just won’t make it. April, thanks for sharing your process. It’s helpful to know that others struggle with it, too, and that we can help support one another. Your liberating truths are inspiring! You are not alone, Andrea!! I struggle with the same limiting beliefs over and over and over again. 🙂 But I remember one time at a FranklinCovey seminar, they encouraged us to review our notes the next day, and then the next week, and then two weeks later, and then a month later, etc. so we would slowly adopt those things into our psyche. That works! The more we confirm what we KNOW is true, the more we will stop letting those limiting beliefs affect us. We’re on this journey together!! Thank you so much for sharing! Your honesty and specifics inspires me to push forward and take the next step of writing my lists! Your kind and compassionate spirit… as well as your incredible professional wisdom blesses my heart! Thank you so much for sharing! Just the way you articulated some of your limiting beliefs helped me to identify some of the things I am thinking subconsciously. I am excited to try this exercise. Would you mind helping me to understand what the negative impact rating means next to the liberating truths? I’m not sure why there would be a negative impact to identifying liberating truths. Is it the negative impact you will feel if you don’t believe the liberating truth? Thanks for all you do! Great question! The negative impact rating is how much your limiting belief is negatively impacting you…. Oh- got it! Thanks again! Thank you for sharing!! I’m working through designing my goals with Michaels Hyatt’s book Your best Year Ever. I didn’t write out my dreams in each area but I think I will after reading yours. Seeing what you are doing is so inspiring and helpful. I see myself in so much of what you wrote. Thank you! This is wonderful! Have fun dreaming and believing in the great things to come in your life! Thank you April for openness, courage and clarity in your writing. 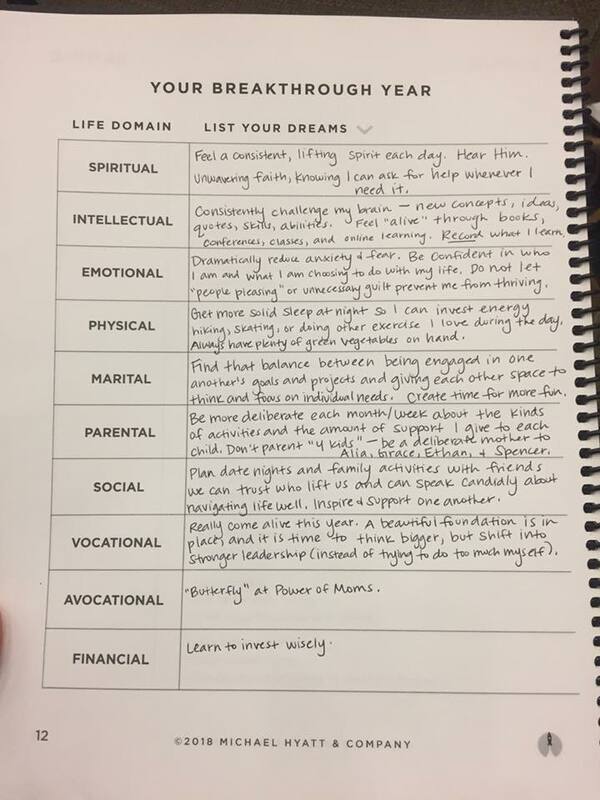 I am a mother of six and have very similar dreams and limiting beliefs in seven areas you described. This is incredibly powerful! Thank you for sharing your personal thoughts and journey. I’ll need to go through this for myself so I can calm the negative in my head. Excited for you to go through this, too, Amy! The more I learn, the more I realize most of our challenges are in our heads. 🙂 Thanks for being here with us!